Home décor is a personal preference; each individual sees their own beauty in a work of art. 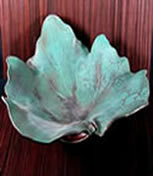 I enjoy creating a large variety of works in an effort to rouse the emotions and excite an interest in my works of clay. Each piece is signed. Shown is a Japanese flower basket, called a Hanakago, designed for flower arranging. This type of flower basket requires a delicate technique which is very time consuming; but the results are beautiful. Click on the photo to visit the Home Décor gallery. Functional pottery is by no means basic dinnerware. The right presentation of a meal can make a great difference in how the food is perceived and enjoyed. I believe unique dinnerware and serving pieces enhance the dining experience; this is what I create. Claymakins' stoneware is lead free, oven, microwave and dishwasher safe. 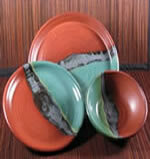 Shown is an example of the River Series dinnerware. Click on the photo to visit the Functional Pottery gallery. Years ago sculpting whimsical faces on mugs, bowls and planters became one of my trademarks. Later I found leaves made the perfect canvas for faces and started creating Leaf Spirits. My love of nature inspired me to create other unique pieces of art that when placed at focal points around the garden add fun and stimulate conversation. Click on the photo to visit the Garden Art & Whimsical gallery. When I touch clay, my imagination goes wild and I sometimes never quite know what the outcome will be. In this case it was Happy Curmudgeons (cur`mudg`eons), humorous little people that constantly make me smile! Shown is a Curmudgeon which has been individually sculpted; nothing has been molded so it is truly an original. My Curmudgeons hang on a wall and vary in size between 8” and 12” tall. Click on the photo to visit the Happy Curmudgeon gallery. Inspired by my Native American ancestry, I have created: sculpted Native American figures which are embellished with leather, turquoise and feathers, hand built Spirit Masks, Cave Lamps with carved faces inside that give a nice ambiance to a room, and my interpretation of ancient petroglyphs carved into clay. Click on the photo to visit the Native American gallery.